Hello...just decide to write something about me...so i title this post Tuscany ´coz is the region of Italy where i come from and where i just came back after 3 years and half spent away. Tuscany is a region situated in the center of Italy,known for its gorgeous landscapes,its rich traditions and its long history,is the true birthplace of the Italian Renaissance. These 2 pictures has been taken a couple of weeks ago in a small town called Portovenere,located on the Ligurian coast,in 1997 has been designate by UNESCO as a WORLD HERITAGE SITE. 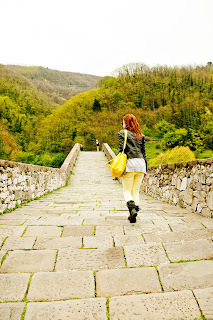 Since i came back to my own region i decided to discover all the small town that i´ve never seen in the past ´coz i was always focus on travel outside the place where i come from.When you go back to the place that you left long time ago everything has a different taste.These pictures has been taken in a small town called Borgo a Mozzano,50 minutes driving from the nearest main international airport Galileo Galilei situated in Pisa.Borgo a Mozzano is famous for his Devil´s Bridge.